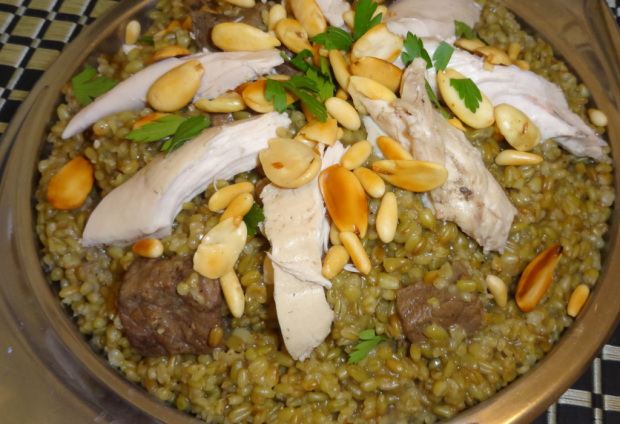 Freekeh is green wheat, roasted, smoked and dried. It is a very nutritious grain which contains a large amount of protein, vitamins and minerals. The use of this green wheat goes for back more than 2000 years ago. It can be used as a side dish like rice or couscous, and can even be mixed with some vegetables in a salad. The recipe I will be showing you uses the green wheat as a main dish. The recipe is from the south of Lebanon, and I learned it from my mother in law. The south of Lebanon is well known for the plantation of the wheat like the Bekaa area in the East of Lebanon. This grain can be found in Gourmet shops or in big supermarkets in foreign countries.